When the company server (or your business laptop) crashes and burns, and your precious mail, files and other critical information remains inaccessible, you’ve potentially got a big problem… especially if you absolutely need to perform a data recovery service to retrieve that vital information and data. What can add insult to injury is if you unsuccessfully attempt to perform this data recovery yourself (as many Do-It-Yourself South Africans will) and end up damaging your data even further or destroying it altogether. Being faced with the consequences of what the potential replacement costs then might be can be the very stuff of regret. 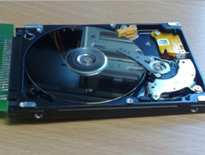 Cloning data from faulty hard disk drive to a functional hard drive. Do you really know what your data related problem is? Depending on whether the problem is logical, electrical or mechanical (or a difficult combination thereof), identification of the problem is the first mistake DIY Data Recovery amateurs often make. It’s critical that the right problem be identified from the start so that you don’t end up trying to fix what ain’t broken or compound your problems further. 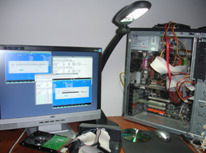 DIY Data recovery can take up a lot of your time with a steep learning curve. How savvy are you or your “technical” staff really with computer hardware technology and what is the potential time investment you’ll need to truly find a solution or software that will solve your particular data recovery issues? Often, the steps prescribed to perform your own data recovery services yourself are complex, require a steep learning curve and a lot of time to aptly apply. So many Data Recovery Programs and methods to chose from? Presuming that your problem can be solved by running a program, there are literally hundreds of Data Recover software programs to purchase on the Internet alone that perform very specific solutions… But which one is right you? You may spend many hours finding the right one and if you end up buying the wrong software you’ve lost money on the purchase and the time it took to find and buy it. And let’s then only mention the fact that you’re back at square one and your problem could be getting worse. Do you really want to start taking your hardware apart yourself? Let’s presume that you are computer savvy enough to know that you have a mechanical or electrical problem. 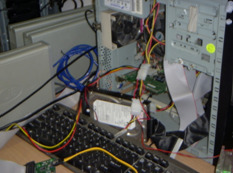 There are many tips for this course of action suggested by computer geeks that wrongly presume (in most cases) that you have a similar wealth of experience in handling computer hardware components. But if you don’t really know what you’re doing, this is akin to taking apart your own car’s engine yourself without understanding a car’s basic mechanics to begin with. Computer hardware is a lot more fragile than you think and tampering with undetected (and even multiple) electrical or mechanical failures can lead to total destruction or loss of your data, and possibly further damage to your computer and its components. If you don’t feel 100% confident doing it – don’t. Yes, there is a cost involved in applying any worthwhile solution. But simply looking at the cost of a solution without realistically looking at the cost of the problem is not looking at things responsibly. Doing a DIY data recovery service yourself is of course always an option – but if you take the above points seriously, then there is another smarter and more meaningful one out there like employing the use of a specialist Data Recover Service provider like Data Detect. Data Detects trained and experienced Data Recovery technicians and experts will provide you with a free assessment to identify your data problem(s).They’ll then clearly explain (in non-techi terms) what your options are and where they’ll be able to help you. Leave your hardware with Data Detect and return to work with the knowledge that the very best is being done about retrieving your information because if anyone can retrieve your data safely, it’s Data Detect. And the great thing about this whole process… If Data Detect cannot retrieve your lost data – you don’t pay! That’s right. No data, no bill. Data Detect is not for everybody, but definitely for those serious about having the right data recovery services performed to maximise the return of their data safely without the unnecessary waste of time, money or effort. Contact Data Detect today for a free assessment of your Data Recovery needs. This entry was posted on Friday, February 5th, 2010 at 9:51 am	and is filed under data recovery services. You can follow any responses to this entry through the RSS 2.0 feed. You can leave a response, or trackback from your own site.